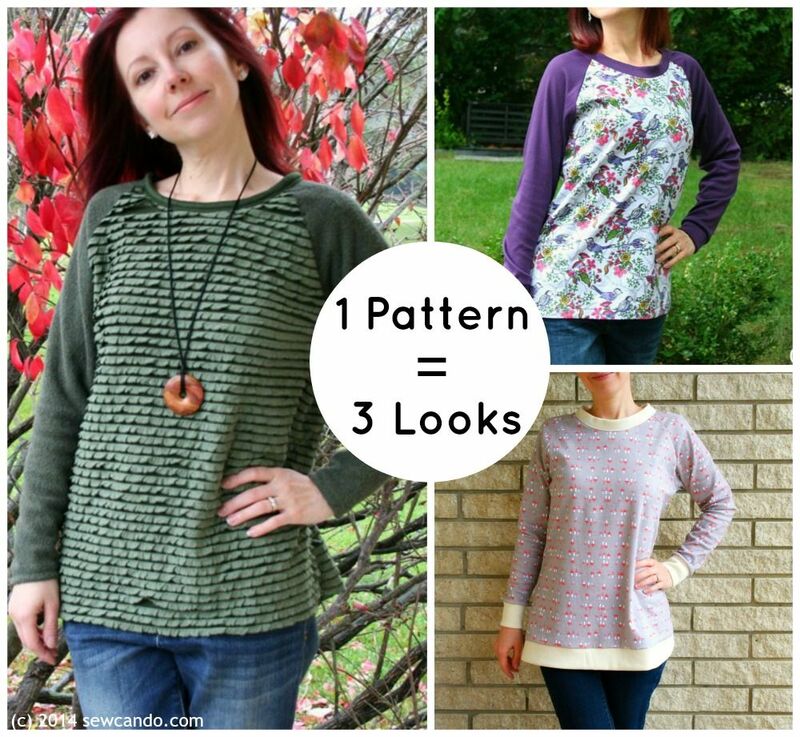 Sew Can Do: 3 Looks 1 Pattern & A Seamingly Smitten Pattern Giveaway! 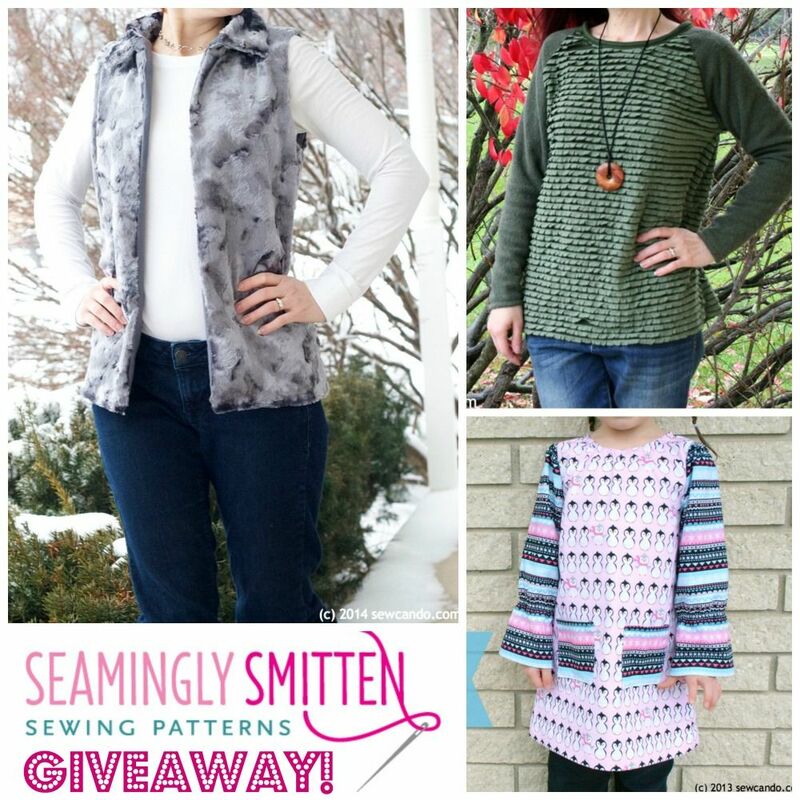 3 Looks 1 Pattern & A Seamingly Smitten Pattern Giveaway! It's great when you find a fashion pattern you like, but how do you keep it fresh so you don't end up with a closet full of the same thing? 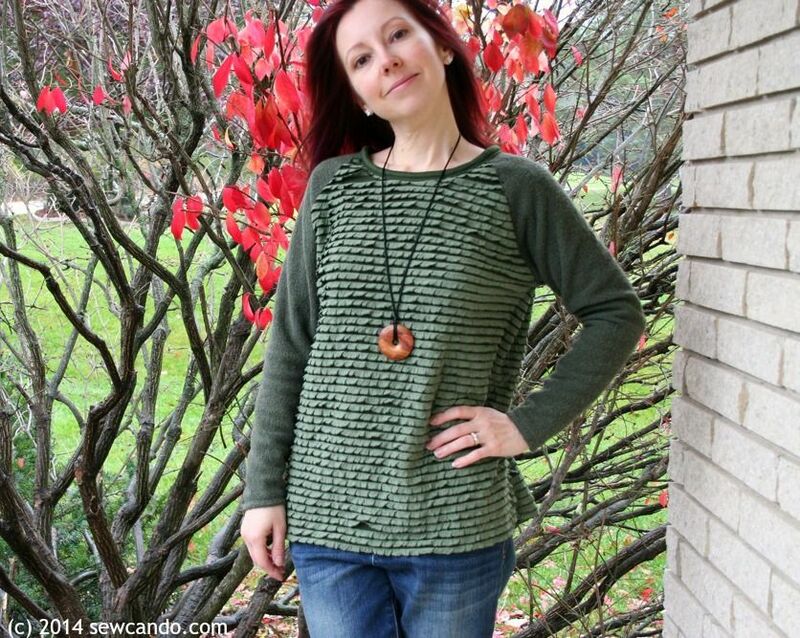 Today I'm sharing how changing fabrics, and a few small details, gave me a bunch of new tops from one pattern, but don't look overly same-y. 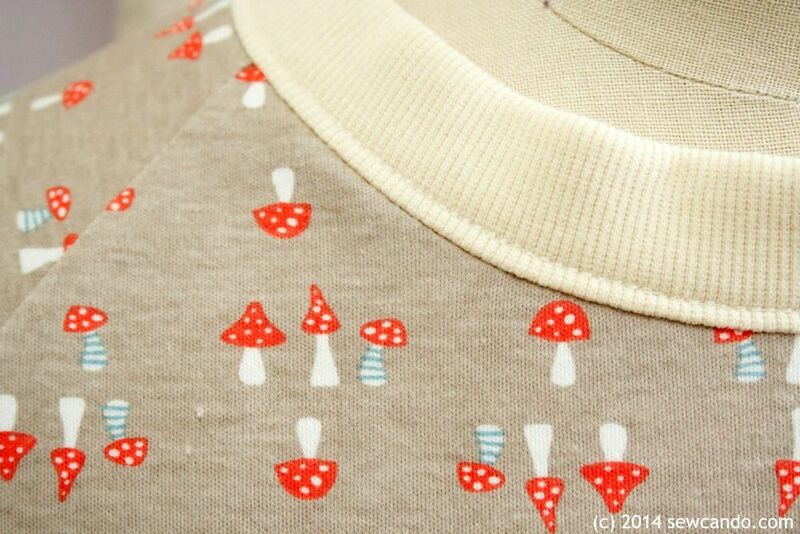 And I've also got a giveaway for a choice of 3 patterns from Seamingly Smitten to get more of those sewing ideas brewing! You may remember my first try with this pattern a few months ago. 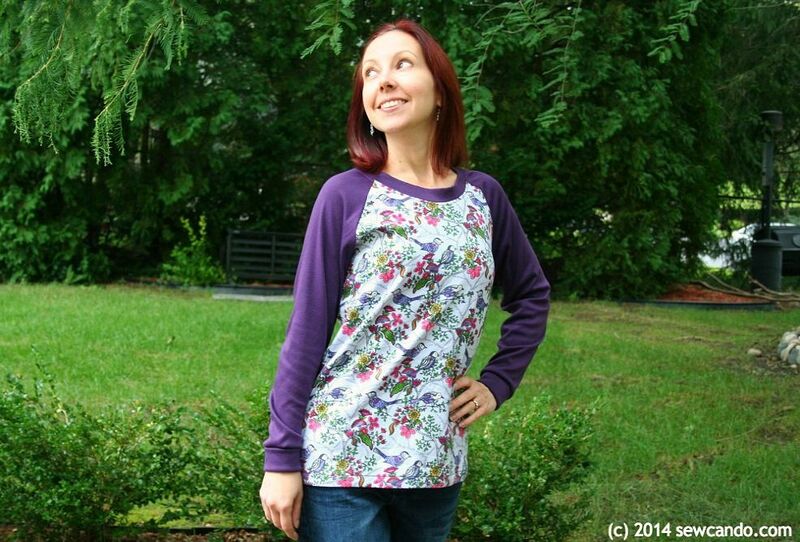 I shared my review of Seamingly Smitten's Women's Raglan Top pattern and how to do a few modifications to turn it into a whimsical ringer tee here. I took the pattern and curved the side seams inward to make it a bit more fitted, added fold-over cuffs and a folded neck band. I've worn that top so often I decided it was time to make a few more and switch 'em up a little each time. Ready for a little raglan top fashion show? 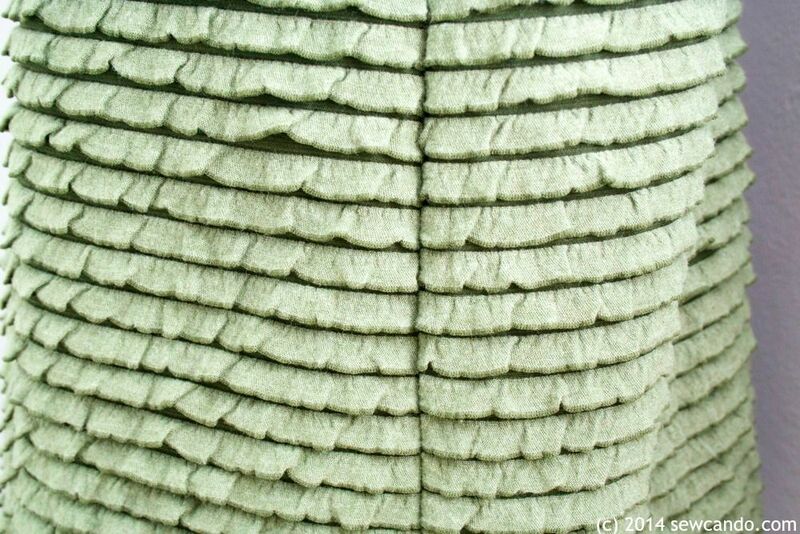 For this version I used an organic cotton knit print for the body plus some ribbed cotton for a contrasting trim. I finished the neck on this one by doing a wide binding over the raw edge with some of the ribbing (and yes those are fun little mushrooms!). 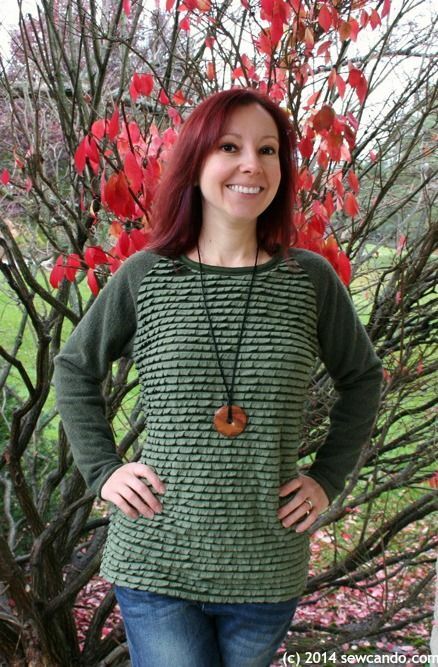 I also added no-fold banded cuffs and a hem band to make it more of a tunic length. It's got a kind of ModCloth vibe to it, but without the usual crazy high price tags of that site. 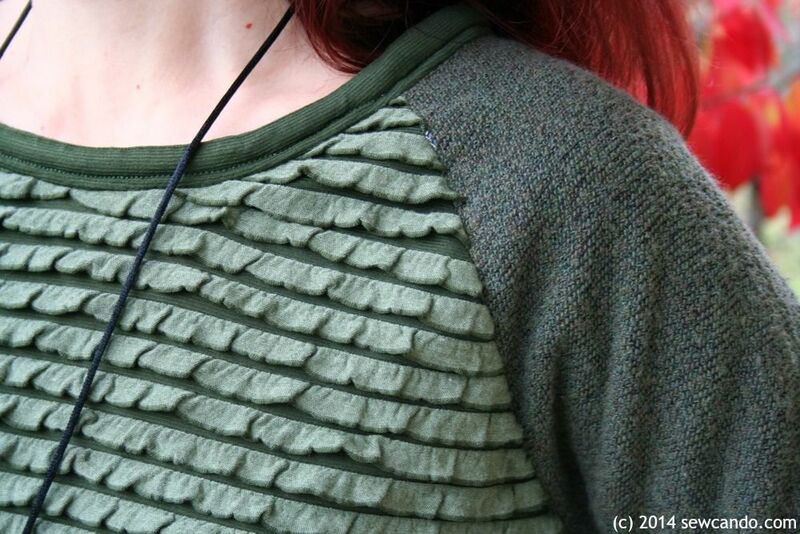 This third version was made with some mini ruffle fabric and cotton fleece. 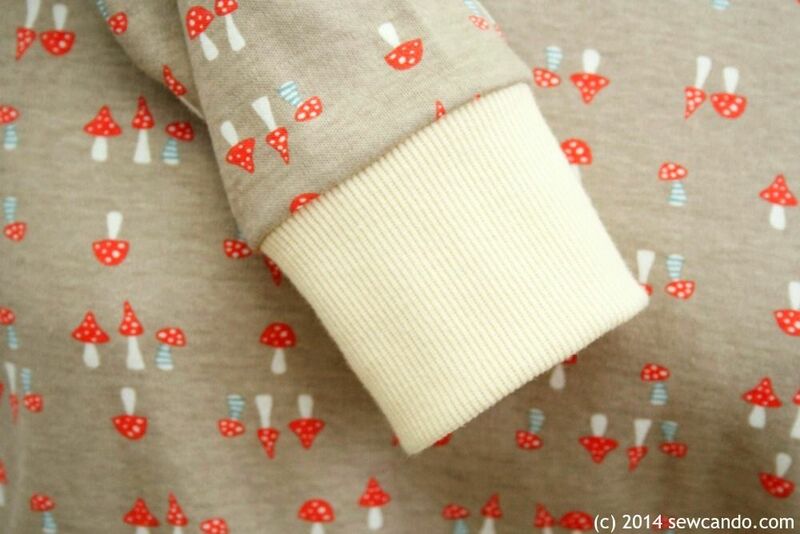 I think that cotton fleece is a great winter fabric - thick but not heavy and very warm. It's name is a bit misleading to me though, because while yes, it's fuzzy on the wrong side like fleece, the right side is definitely a sweater-y knit which is quite un-fleece-like, so it has a very different look than the usual polyester variety. I'm really pleased with how well these two go together though. Very designer boutique. I've been doing Stitch Fix, the fashion subscription box thing, for a few months now and I feel like this looks like something I'd normally get in there, but it cost me under $20 to make! FYI the cotton fleece didn't have enough stretch to use to make a collar or do binding - and you can't really fold ruffles under on a curve without them looking crazy - so I cheated. I just cut a strip of the ruffle fabric, cut the ruffles off and then used it wrong side out to do the neck binding. The amount of stretch was ideal. Perfect color match and no need for a third fabric = win! Confession time: This was my first try using ruffle fabric. I know, I'm kind of behind the times. I'd gotten this last summer and some other colors nearly a year before but kept hoarding them until "the right" project came along. I finally realized the hoarding wasn't getting me anywhere, so don't be afraid to use those special fabrics - wearing them is much better than keeping them on a shelf. 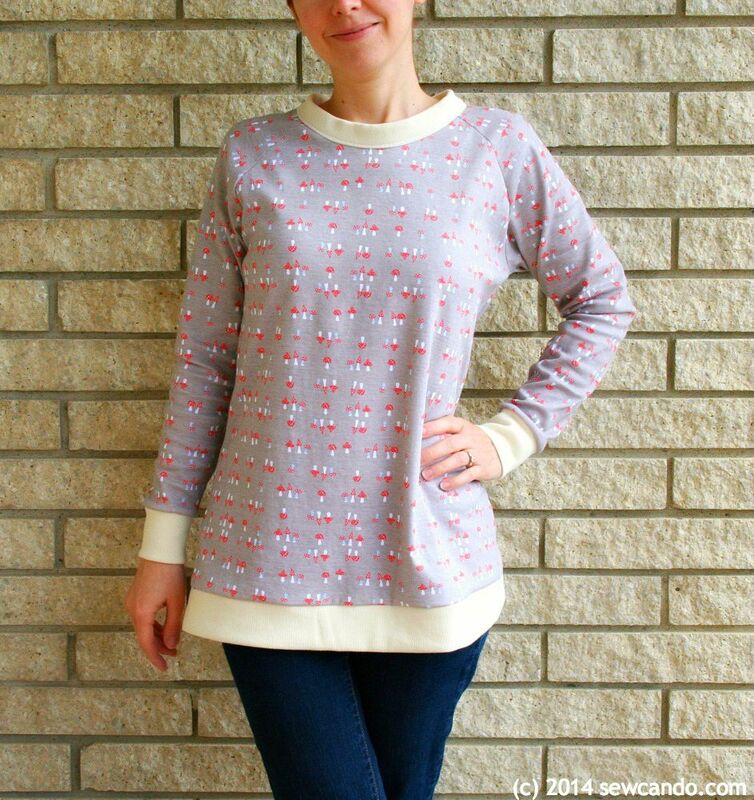 And if you want to get sewing this weekend and get a great deal, through the end of today (11/14), you can use the code SEWHAPPY55 to save 55% on all patterns in the Seamingly Smitten Etsy shop. Ooo! Lots of cute patterns. Maybe the Esplanade coat? The Magnolia Street Wrap dress! I like the Leslie Flutter Top. Love the Magnolia Street Wrap! So like the draped cardigan. Also the shirred sundress (even though it's winter) ! I really like the Magnolia Street Wrap Dress (but the Raglan Sleeve shirt is another favorite)! The Around Town bag at The Green Hedgehog is my fave pattern. Both the raglan sleeve top and the esplanade jacket thrill me. I am SEW in love w/ the Cozy Hooded Cape for kids! Thanks for this giveaway! Esplanade coat is great!! LOVE it. Around town bag is so cute!! 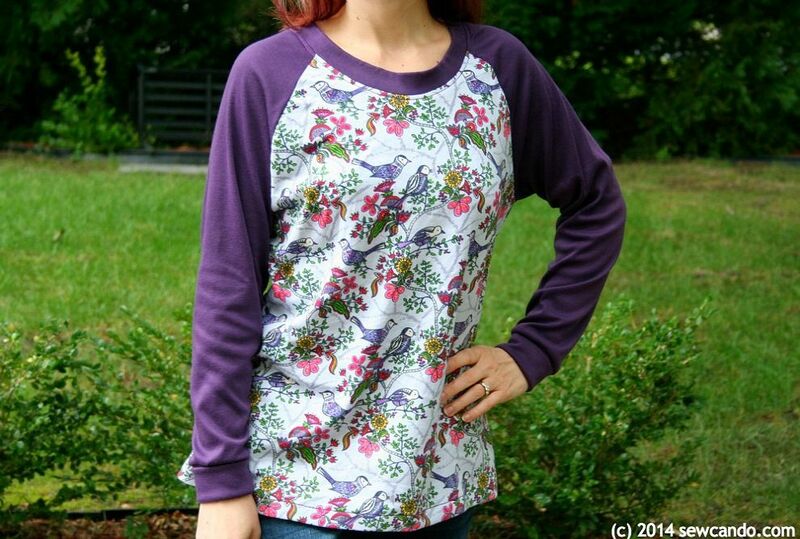 I love the raglan sleeve, split neck top pattern. The dynamite dinosaur cape is great! i really love the raglan. the belted cargos are great too. The Raglan!!! Love the versions above!! The yoga pants pattern is great! I love Cozy Hooded Cape for kids sewing pattern, cape tutorial.